PayPal integration is made using a Webform that transfers the customer to the PayPal site. This payment method allows automatic Order Status Updates. There’s a file in /administrator/components/com_virtuemart/ which is called notify.php. You will need to enter the appropriate URL (web address) for the script file in PayPal’s control panel. When a customer finishes the Payment, the PayPal server connects to this script on your server. When the transaction AND the payment have been successful, the order status is automatically updated to the status you have set in the PayPal configuration form. When I start working with new clients, the invariable question is what are the process steps in a SEO project? If you are planning a new website, the issues are somewhat different than with a website already online. A new website has to deal with the Google Sandbox and establishing TrustRank, which can take anywhere from 2 to 6 months or longer based on my experience. Completing my website design questionnaire will be helpful. Also complete my SEO questionnaire. If your website is already online and your home page is in Google’s index (search for cache:www.yourdomainname.com in the Google search box) or if you have a Google PageRank, then the issues are somewhat different. Being older is a good thing in the case of Google. Being newly online is not. If you are targeting the wrong search phrases and keywords your web will not connect with the searchers you want. Search Engine Optimization is mostly about words. Without well written page copy, you will have a very difficult time ranking for anything. Flash webs or embedded files, words in graphics, etc. are not content that search engine spiders and robots can read. If you want rankings, you must have well written page copy. Websites designed in frames can be made to work with search engines but a redesign will probably work better in the long run. What are your goals for the website? Do you want online sales? Inquiries? Information downloads? To make referrals to another information source? It is not unusual for different pages in the website to have different goals. Every page with good content in a website can be a landing or direct entry page from organic search. Every important page in the web needs to be targeted to something people are searching for. As noted above, if you are targeting the wrong search phrases and keywords your web will not connect with the searchers you want. How do you know what people are searching for? Obviously, you can guess. A better way to target web pages is to discover what people are searching for using an online research database service like Wordtracker. Read about keyword services. Complete my SEO questionnaire. Keyword research needs to be refined to the most relevant targets. This process requires both an understanding of the market being addressed (the client’s viewpoint) and which targets offer the best opportunity for achieving a decent search engine ranking (the optimizer’s viewpoint). Relevance is key to conversions, so the more specific the subject matter of a page in the website, the more likely it is to accomplish the goal as defined in item 1 above. Highly specific targets are likely to have fewer competing web pages already in the index of the major search engines, which improves the opportunity for higher rankings. What are the demographics of your best prospects? Writing page copy for a teen audience is totally different from copy for baby boomers? These two groups might be looking for the same content, but how you present your message can make or break your opportunity to create a conversion to an inquiry or sale. Content is king. Once the targets are selected and we understand the demographics of our prospects, we are ready to begin creating page content. The key questions are where will the content come from? Existing information in text form can often be edited to be suitable for the web. The alternative is to write the content from scratch, which is both time consuming and requires a copywriter educated on the subject matter. Read web copywriting basics, web content provider and ideas on adding quality content to your website for ideas to add good content. An important point about content: Content that creates conversions should be written for your web visitors – not for you – not for search engines. Top Google rankings and volumes of traffic to your website are of NO VALUE if web visitors don’t inquire or don’t purchase? Focus on the ratio of conversions to visitors, not just rankings and traffic volume. And, look at 7 and 8 below. Your website needs to be structurally correct. Google does a good job of making clear the things that make a good website in their Webmaster Guidelines. It appears to me that few web designers take these recommendations to heart. Read my recommendations on how to increase your Google hits. Part of the issue with structural correctness is making it easy for search engine spiders and robots to quickly find new content in your website. Your website needs to be easy to navigate. Read web usability guru Jakob Nielsen’s recommendations and website usability tips. If your web visitor is lost, your opportunity to communicate and convert is lost. Keep it simple. For some humorous examples of learning what to do by seeing what not to do, visit Vince Flanders’ WebPagesThatSuck.com. Your website needs to be credible. Website credibility is a crucial part of earning conversions for inquiries and sales. Great web usability, great content and great rankings are wasted if folks who visit your web can’t tell that you are worthy of their trust. Read about Stanford University’s research which is a valid today as when the study was originally conducted in 2002. Before implementing changes to a web already online, establish a current benchmark. If your existing website has rankings, those need to be preserved and strengthened? Absolutely. A ranking analysis of your existing content is the first step to determining how to improve on what you may have that is working and as a basis for monitoring the results of improvements. An analysis of existing web statistics is also part of the process. If you don’t have good web stats, you need to move your hosting to someplace that does. Good web statistics are critical to monitoring the performance of your SEO project. Google Analytics are good for AdWords but are not great for organic optimization. We need good web stats to monitor your website performance and can show you some examples. Links in to your web are critical, especially for Google. Google says in their patent applications and elsewhere that links in to your website are equal to a positive vote for your web content. Contrived links like purchased links from link farms are not good. Reciprocal links are usually of little value. Purchasing links from reputable directories is a good way to get started. If you have good content, other websites will link to you for the value of the information in your content. Links help our crawlers find your site and can give your site greater visibility in our search results. When returning results for a search, Google combines PageRank (our measure of a page’s importance) with sophisticated text-matching techniques to display pages that are both important and relevant to each search. Google counts the number of votes a page receives to determine its PageRank, interpreting a link from page A to page B as a vote by page A for page B. Votes cast by pages that are themselves “important” weigh more heavily and help to make other pages “important.” Please note that ranking of sites in our search results is completely automated, and we don’t manually assign keywords to sites. Only natural links are useful for the indexing and ranking of your site. Here is the source for How can I create a Google-friendly site? A proactive strategy for establishing links over time is key to your success. Research and testing confirms that it is not the quantity of links that matters as much as the quality of websites linking to you. A good linking campaign takes time and over time is of great value. Establish a plan for continually adding content and do it. A great website is never finished. Adding new content is of value both to web visitors and to search engine spiders and robots. Without new content, the frequency of spider and robot visitation will decrease, which gives your competitors an opening to outrank you. Read ideas for adding quality content to your website. A page a week, a page a month, new product information, an email newsletter published as online content, customer testimonials are all good ways to keep adding content. There is more to it than this, but these are the basics of a good SEO project management process. For more information, please contact us. 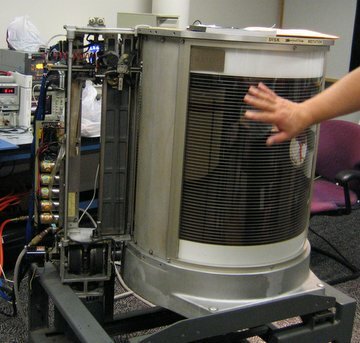 The IBM 305 RAMAC, publicly announced on September 13, 1956, was the first commercial computer that used a moving head hard disk drive (magnetic disk storage) for secondary storage.